Hawkins is famed for reconstructing the design of English ships in the 1580s and commanded part of the fleet which repelled the Spanish Armada in 1588. But it was his drive to acquire and sell African slaves which prompted Hawkins's distant relation to take his own journey to that continent several centuries later. Andrew Hawkins, of Liskeard, Cornwall, is a 37-year-old married father-of-three who runs a youth theatre company and claims to be the sailor's descendant. "It had always been part of the verbal history of our family, that we were related to Sir John Hawkins. "It was a standing joke in the family that we had a pirate in the family. "When I was a child I was quite pleased to learn of this family link and in Plymouth John Hawkins is a bit of a local hero. "His picture used to be up in a subway there, along with Plymouth heroes. As a boy I used to be pleased to see it and to think I was related to him." But in 2000 Andrew's perspective was forever altered when he learned the truth about his ancestor. "I heard David Pott, from the Lifeline Expedition, speak in 2000 and he mentioned how Hawkins was the first English slave trader. "It was a bit of a shock and it really challenged me, particularly because Hawkins named his ships things like Jesus of Lubeck and the Grace of God. "That really offended me, particularly the latter name. God's grace has nothing to do with being chained up in the hold of a ship, lying in your own excrement for several months. 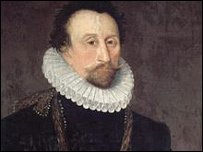 "So often things are done in the name of God that are horrific for mankind and I think God would consider what Sir John Hawkins did to be an abomination. "It's quite shocking that he could think it was justifiable." Andrew says slavery was never justifiable, even in the 16th Century, when people often say society "didn't know any different". He says: "We don't try to justify the Jewish Holocaust but this was an African Holocaust. "We have to face our history and our own personal consequences. I went to show people that I didn't think what happened was right and not everybody thought it was acceptable." Andrew and his fellow members from the Lifeline Expedition made their apology at The International Roots Festival, held in the Gambia in June. This event, which runs for several weeks, encourages Africans to discover their ancestral identity. The group of 27 spoke up at a football stadium in the capital Banjul, at the end of the festival's opening ceremony. They made their way to the stadium by walking through the streets laden in yokes and chains, before eventually speaking their words of atonement. They included people from European nations such as England, France and Germany but there were also representatives from Jamaica, Barbados, Mali, the Ivory Coast and Sierra Leone. "Black people came to apologise because black people sold black people to Europeans," Andrew said. Andrew estimates the 25,000-capacity stadium was about two-thirds full, with delegates from African nations, Gambian vice-president, Isatou Njie-Saidy, and Rita Marley, widow of reggae legend Bob Marley, among the crowd. He says: "The crowd died down to a hush. Some were looking at us, others were reading through their programmes to work out what we were doing. "One lady at the front must have realised because she started applauding, then everyone did the same. "That was a moving moment, because I wasn't sure if they would be happy to see us." The group apologised in French, German and English - the languages of the nations responsible for much of the African slave trade. The apology had not been rehearsed. Andrew said: "It's hard to remember what I said. I did say that as a member of the Hawkins family I did not accept what had happened was right. "I said the slave trade was an abomination to God and I had come to ask the African people for their forgiveness." Vice-president Njie-Saidy joined them on stage and, in an impromptu speech, said she was "touched" by the apology before coming forward to help the group out of their chains. Andrew says: "I was really overwhelmed with her generosity because she chose to forgive us, which is a very powerful thing. "Afterwards people came on to the pitch to talk to us and there were some very emotional responses." But does Andrew really believe it was worth apologising for events that happened more than four centuries ago, on behalf of a relative who is so very distant? "Yes. It's never too late to say you're sorry," he said.